Wolf Trap, America's National Park for the Performing Arts, seeks fall interns for Communications and Marketing, Development (donor relations and special event) and Education positions. Internships are 12 weeks long, part-time (18 – 21 hours per week) and all positions are paid. For individual position descriptions please see web site at wolftrap.org/internships. Applications must be in no later than July 1, 2014. Find out how to apply in our CM Internship section. 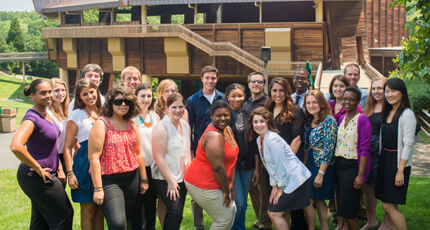 Photo of the 2012 Interns via Wolftrap.org.